Oreos are a classic snack that everyone grew up loving. But have you ever thought about taking this sandwich cookie to the next level? There are many easy recipes that you can use to turn your Oreo cookies into an amazing mouthwatering dessert. From Salted Caramel Oreo Bars, to Double Stuff Oreo Pancakes. These recipes will definitely satisfy your sweet tooth. Now, lets take a look at some drool worthy Oreo dessert recipes that will have you wanting more. 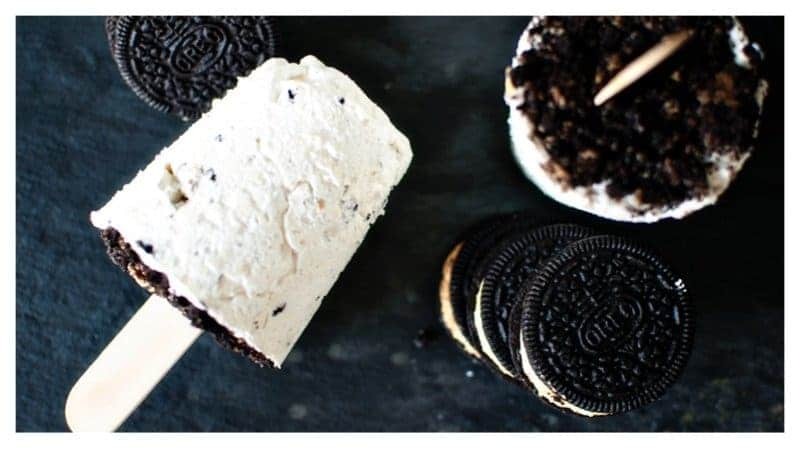 Ever considered mixing peanut butter and Oreos to create an amazing Popsicle? This recipe will definitely make your taste buds sing. Ingredients: 1 container of whipped cream, 8 ounces of softened cream cheese, 18 Peanut Butter Oreo cookies, plus 4 wooden sticks. Directions: In a Ziploc bag, beat the cookies till they are broken into large chunks. In another bag beat the remaining Oreo’s until crumbly. In a large bowl, whip cream cheese until light and fluffy. Fold in the whipped cream and cookie chunks. Pour mixture into Popsicle molds or wax lined disposable cups. Gently pat down to make sure all air bubbles are filled in. Insert your wooded craft sticks and sprinkle cookie crumbs on top, pressing gently with your fingers. Freeze for at least 4 hours. Remove pops from molds and enjoy. Have you ever thought about mixing Oreos with a little mint? 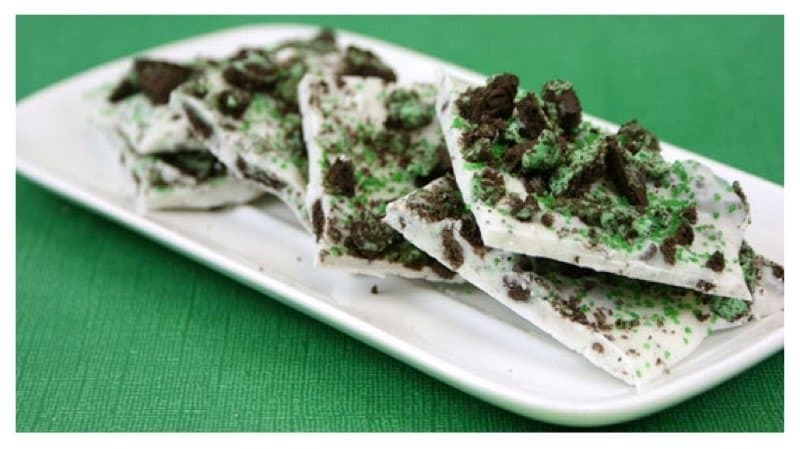 Mint Oreo Bark will give you that minty flavor with a hint of the delicious cookie. Ingredients: 1 (16 oz.) package of Vanilla Almond Bark, 10 chopped, Oreo Cool Mint or Peppermint flavored cookies. Directions: Melt Vanilla Almond Bark according to directions on package. Add 8 of the chopped Oreo cookies and stir to combine. Pour mixture into a 13 x 9-inch pan lined with wax paper. Use a spatula to smooth mixture out evenly in pan. Sprinkle remaining crushed Oreos on top. Let chill for about 10 minutes or until completely set. Once set, remove the bark from pan and cut or break into pieces. Mixing Oreos with a classic breakfast sweet may not be the best idea, but how could you ever deny the deliciousness that is a mini Oreo donut? This recipe will have you wanting more. Ingredients: 2 1/4 cups of cake flour (or 2 cups all purpose), 2 tsp baking powder, 1 tsp salt, 1 cup sugar, 2 eggs, 1 cup Cream, 4 tbsp melted butter, 1 tbsp vanilla, 1/2 cup roughly chopped Hershey’s Cookies and Cream Pieces. Glaze Ingredients: 1 cup powdered sugar, 1/2 cup cream, 1 tsp vanilla, 1/2 cup crushed Oreos, for topping. Directions: Preheat oven to 350°F and grease donut pans with cooking spray. In a medium bowl, whisk together sugar, eggs, cream, butter, and vanilla. In a large bowl, sift flour, baking powder, and salt. Pour wet ingredients over dry ingredients and stir until smooth batter forms. Fold in cookies and cream pieces. Pour or spoon batter into donut pan, filling each cavity about 2/3 full. Bake at 350°F for 10-12 minutes or until a toothpick comes out clean. Turn donuts out of pan and onto a cooling rack. Glaze: Whisk together sugar, cream, and vanilla until glaze forms. Dip half, or all if you prefer, of donut in glaze. 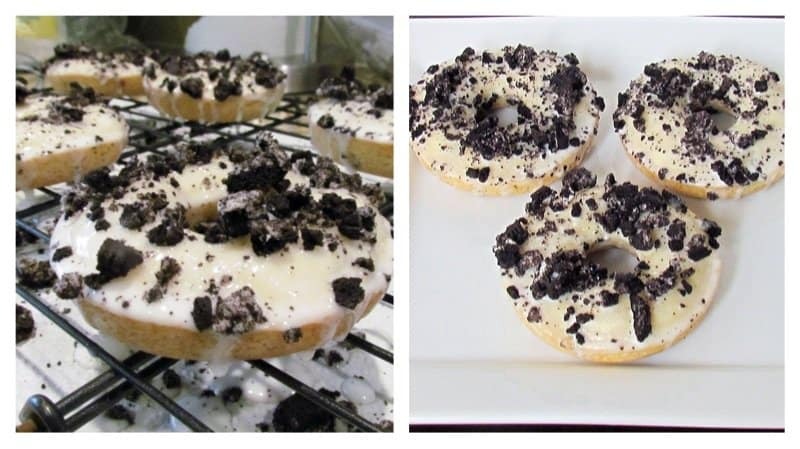 Allow donuts to set and dip again before covering with crushed Oreos. There is nothing better than biting into a truffle. But when you mix in an Oreo cookie, you have a little piece of serenity in the palm of your hands. Ingredients: 1 package of Oreos split in half, 1 8oz. package cream cheese softened, white chocolate bark. Directions: Finely crush 7 cookies in a food processor or place them in a Ziploc bag, crush until consistent. Save for later. Crush remaining cookies and stir in softened cream cheese. Mash together. Roll the mixture into 1″ balls and place on wax paper covered cookie sheet. Melt chocolate as directed on the package and dip balls into chocolate, tap off extra and set aside on a wax paper covered cookie sheet to dry. Sprinkle crushed cookies on the top for decoration. Let them dry and refrigerate. 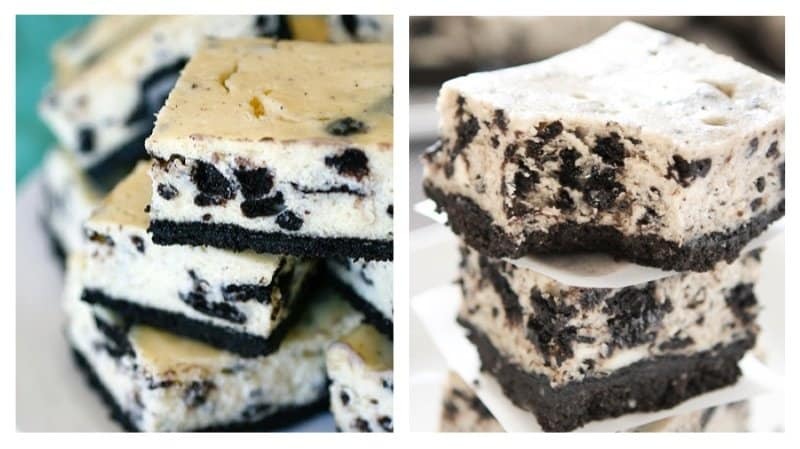 For the cheesecake lovers, consider making these easy Oreo Cheesecake Bars. This dessert will most likely disappear at the next party you’re hosting or attending. Ingredients: Crust: 23 Oreo cookies, 2 tbsp. unsalted butter, melted. Cheesecake: 12 oz. cream cheese, at room temperature, 6 tbsp. sugar, 6 tbsp. sour cream, room temperature, 1/2 tsp. vanilla extract, 1/4 tsp. salt, 1 large egg plus 1 egg yolk, 12 Oreo cookies, roughly chopped. Directions: Preheat oven to 325˚F. Line an 8 x 8-inch baking dish with foil. To make the crust, place the Oreos in a food processor. Process, until the cookies are finely grounded. Add melted butter and pulse until the cookie crumbs are moistened. Transfer the mixture to the prepared baking pan. Press the crumbs into an even layer over the bottom of the pan. Bake the crust for 10 minutes, then set aside and prepare the filling while maintaining the oven temperature. Filling: Add the cream cheese to the bowl of an electric mixer. Beat on medium-high speed until light and smooth; about 2 minutes. Mix in the sugar until well combined. Blend in the sour cream, vanilla and salt. Beat in the egg and egg yolk on medium-high speed until incorporated, scraping down the bowl as needed. Stir in the chopped Oreos. Pour the cheesecake batter over the prepared crust, smoothing the top with a spatula. Bake for about 40 minutes, until the cheesecake is set around the edges but slightly wobbly in the center. Transfer the pan to a wire rack and let cool about 1 hour to room temperature. Cover the pan and refrigerate until well chilled; for about 3 hours. Everyone loves brownies, red velvet cake and Oreos separately. This triple threat dessert will have you reaching for your favorite ice cream to create a mouthful of chocolaty goodness. Ingredients: 1 box red velvet cake mix, 1.5 cups butter, divided, 2 eggs, 1 pack of Oreos (about 36), 1 bag of milk chocolate chips (11.5 oz), 1 bag mini chocolate chips (12 oz) , 1 cup heavy whipping cream. Directions: Preheat oven to 350°F. Line a 9 x 13 in. baking dish with foil and coat with cooking spray. Beat together cake mix, 1/2 cup melted butter, and 2 eggs until combined and smooth. Press into the bottom of prepared pan and bake for 15-18 mins, until it sets. Crush whole Oreos in a Ziploc bag or food processor into fine crumbs. Stir together with 1 cup melted butter and mix well. 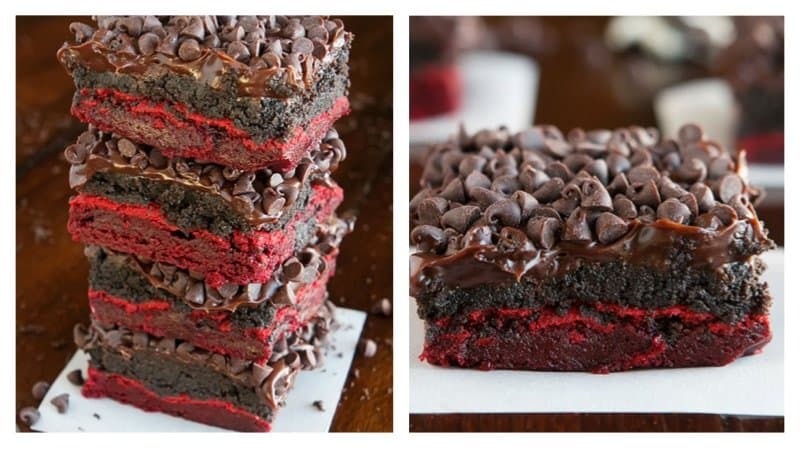 Pour over baked red velvet brownies and gently press down in an even layer. Place the milk chocolate chips in a medium-sized bowl. Let the heavy cream come to a low boil and pour over chips. Let sit for 5 minutes, then whisk together until completely smooth and thick. 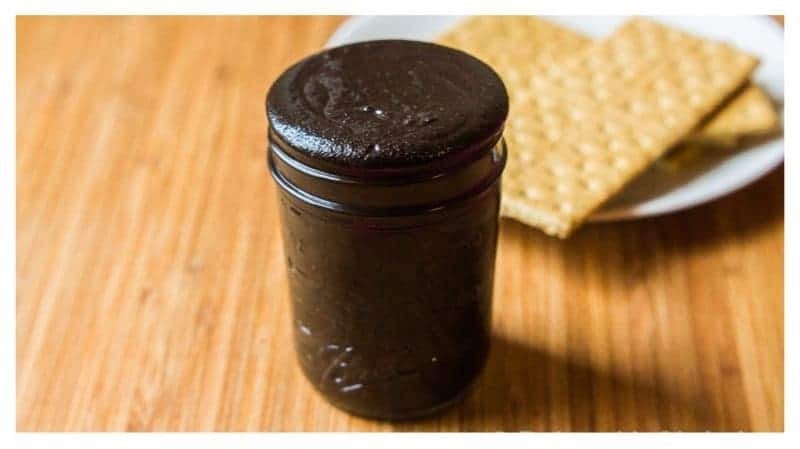 Pour over Oreo layer. Top with mini chocolate chips. Refrigerate for 30-45 mins to allow chocolate to settle. Cut into bars and serve. We know you’ve heard about peanut butter, but have you ever heard of Oreo butter? This delicate chocolate butter will pair well on toast, pretzels, and pancakes or as an ice cream topping. Ingredients: 1 package of Oreo Cookies, 1/3 cup solid coconut oil. Directions: Add the full package of Oreos and the coconut oil in a food processor. Let run for 5 minutes on high speed. Scrape the sides, and let run again for another 3-5 minutes, or until the mixture is very smooth. Let the mixture cool down until it becomes solid. It will still be spreadable. Store in an airtight container at room temperature. 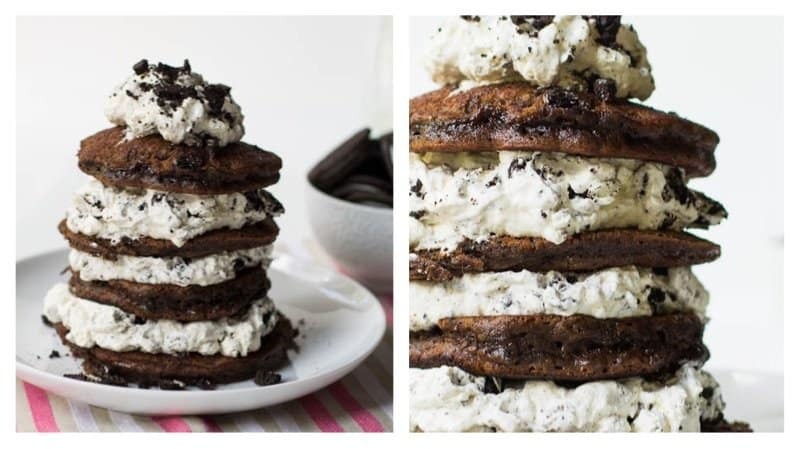 These Double Stuffed Oreo Pancakes will definitely satisfy your sweet tooth. You don’t have to worry about saturating these cakes with syrup; they come with their own sweet icing. Ingredients: 1.25 cups all-purpose flour, 1/3 cup cocoa powder, 1/3 cup white sugar, 1/2 cup light brown sugar, 1/2 cup crushed Oreos, 1 teaspoon baking powder, 1/2 teaspoon baking soda, 1/4 teaspoon salt, 1/2 cup whole milk, 1/2 cup buttermilk, 2 large eggs, lightly beaten, 3 tablespoons Vegetable oil, 1 teaspoon vanilla extract. Oreo Cream: 1.5 cups cold heavy cream, 3 tablespoons confectioners’ sugar, 1/2 teaspoon vanilla extract, 1 cup crushed Oreos. Directions: In a large bowl, combine flour, cocoa powder, sugars, crushed Oreos, baking powder, baking soda, and salt. Stir to combine. In a medium bowl, combine milk, buttermilk, eggs, vegetable oil, and vanilla extract. Stir together. Pour wet ingredients into dry and stir just until combined. Heat a griddle pan or large nonstick skillet over medium heat. Lightly butter or oil griddle before pouring pancake batter. Pour about 1/4 cup batter for each pancake. Cook until set and flip. Oreo Cream: Place heavy cream in a mixing bowl. Beat cream and gradually add in confectioners’ sugar. Add vanilla. Once cream gets nice and thick remove bowl from mixer and mix in crushed Oreos. Spread Oreo Cream between pancakes and on top. This isn’t your ordinary campfire S’mores. 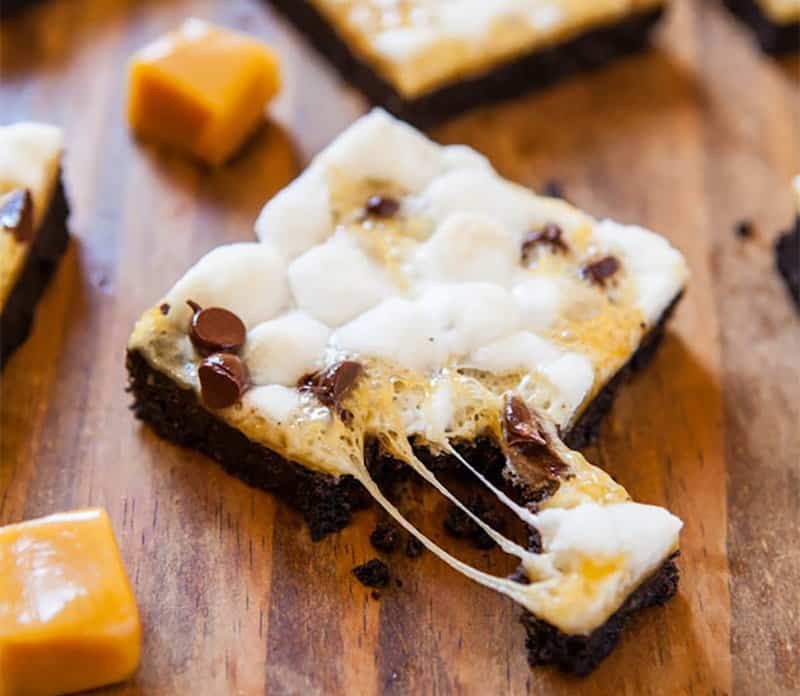 This sweet, gooey treat has everything from caramel, Oreos, chocolate and marshmallow. Ingredients: Crust: 6 tablespoons unsalted butter, melted, 32 Oreo Cookies, grounded. Topping: 2 cups mini marshmallows, 15 caramels, unwrapped and quartered, 3 to 4 tablespoons semi-sweet chocolate chips. Directions: Preheat oven to 350°F. Line a 8-by-8-inch baking pan with aluminum foil leaving overhang, spray with cooking spray. Crust: In a large microwave-safe bowl, melt the butter on high power, about 1 minute. Add the finely grounded cookies and stir to combine. Transfer crumb mixture to prepared pan and pack it down firmly. Bake for 10-12 minutes. Topping: Evenly sprinkle the marshmallows over the crust. Then sprinkle the caramels. Bake for about 5 to 8 minutes or until marshmallows and caramel have begun to melt and remove pan before marshmallows begin to brown. Once you remove it from the oven, evenly sprinkle the chocolate chips, pressing down very lightly. Allow bars to set up for at least 2 hours before slicing. Slice bars by lifting them out using the foil overhang and transfer to a cutting board. Fudge is pretty great by itself. 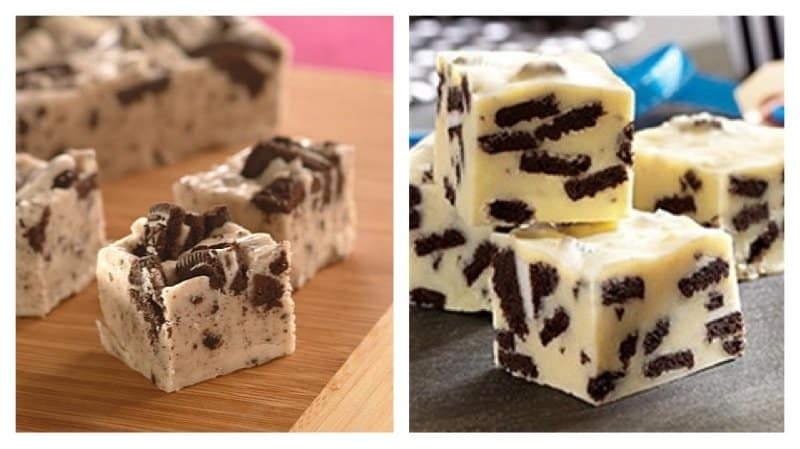 Adding some Oreos to create a cookies and cream fudge will create a delicious, yet familiar treat. 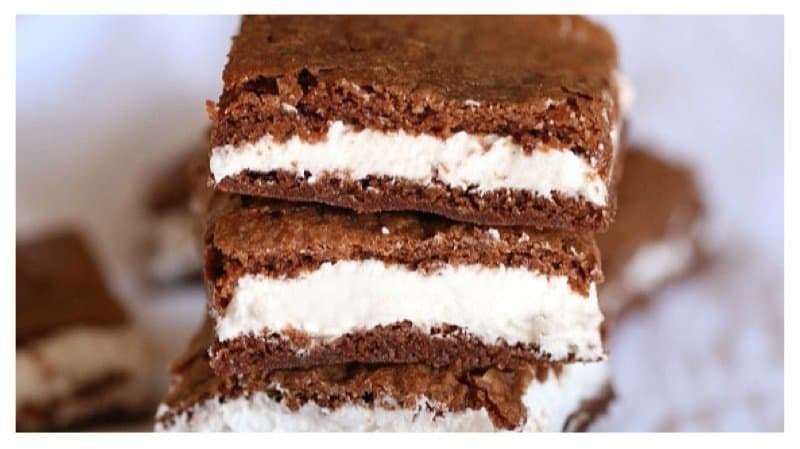 Ingredients: 3 cups granulated sugar, 3/4 cup butter or margarine, 2/3 cup Evaporated Milk, 2 cups white chocolate morsels, 1 jar *7 oz) marshmallow crème, 1/2 cup finely crushed cream-filled chocolate sandwich cookies, 1 teaspoon vanilla extract, 1 cup crumbled cream-filled chocolate sandwich cookies. Directions: Line 9-inch-square baking pan with foil. Combine sugar, butter and evaporated milk in medium-heavy duty saucepan. Bring to a boil, stirring frequently. Once boiled, stir constantly for 3 minutes. Remove from heat. Stir in morsels, marshmallow crème, finely crushed cookies and vanilla extract. Pour into prepared pan. Sprinkle crumbled cookies on top. Gently swirl cookies into fudge using a knife without touching bottom of pan. Refrigerate for 1 hour or until firm. Lift from pan; remove foil. Cut into 48 pieces. Store in airtight container in refrigerator. An Oreo cream filled brownie is a great treat that will probably give you a sugar rush. It’s like eating an Oreo explosion with a brownie layer mixed with a layer of chocolate and another layer of cream frosting. Ingredients: Brownie: 3/4 cup semi-sweet chocolate chips, 1/2 cup butter, cut into cubes, 1 tsp vanilla, 2 eggs, 1 cup granulated sugar, 1 tsp salt, 3/4 cup flour. Filling: 1/2 cup vegetable shortening or butter, room temperature, 1 tsp granulated sugar, 3.5 cups powdered sugar, 1/2 tsp vanilla, 3 Tbsp hot water. Directions: Brownie: Preheat oven to 400° F. Spray a 10×15-inch pan with non stick spray. Line bottom with parchment paper and spray parchment with nonstick spray. In medium microwave-safe bowl combine cubed butter and chocolate chips. Heat on high for 1 minute in microwave and stir until smooth. Add in vanilla and stir. In bowl of stand mixer beat eggs and sugar until pale in color. Add in flour and salt and mix on low until combined. Pour in melted chocolate mixture and stir until incorporated. Spread batter evenly into prepared pan and bake for 8-10 minutes until center is set. Allow pan to cool completely on a wire rack before filling with cream. Filling: Combine all filling ingredients into a mixing bowl and beat until smooth. Loosen the edges of the brownie from the sides of the pan with a butter knife. Invert pan onto a cutting board, this helps to release the brownies from the pan. Cut brownies in half with a knife. Spread filling on the bottom side of one of the halves. Place the other half of the brownie directly on top. Cut into squares. 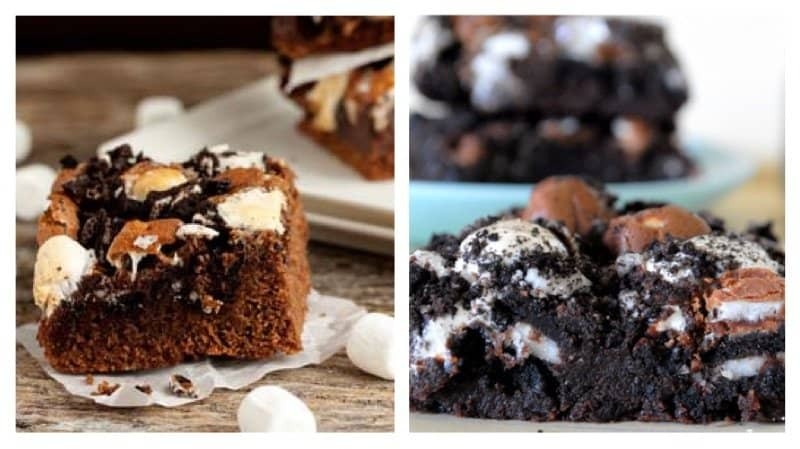 Marshmallow Oreo Brownies could seem like a weird combination. It could however, be deemed as an upgraded version of S’mores with and Oreo twist. Ingredients: 4 ounces unsweetened chocolate, coarsely chopped, 3/4 cup butter, cubed, 1 1/4 cups granulated sugar, 3 eggs, lightly beaten, 1 teaspoon pure vanilla extract, 1/4 teaspoon kosher salt, 1 cup all-purpose flour, 2 Oreos, coarsely chopped, leave 2 tablespoons for topping, 1-cup mini marshmallows. Directions: Preheat oven to 350° F. Line an 8×8 inch baking pan with foil and spray with nonstick cooking spray. In a large bowl, microwave the chocolate and butter for 3-4 minutes or until melted, stirring every 30 seconds. Mix until chocolate is melted. Stir in sugar, eggs, vanilla and salt until combined. Slowly add in flour and stir until just combined. Fold in Oreos and 3/4 cup of marshmallows until combined. Pour batter into prepared pan. Sprinkle the 2 tablespoons of Oreos and 1/4 cup marshmallows on the top. Bake for 30-35 minutes. Cool completely before cutting. Nothing is better than having a sweet and salty treat to satisfy all of your crazy cravings. This snack combines Oreos, caramel and the saltiness of a pretzel. 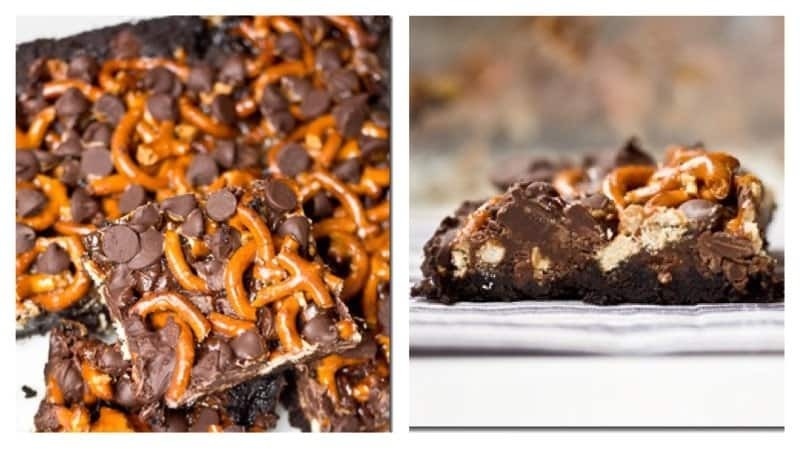 Ingredients: 8 ounces of finely crushed Oreos, 5 tablespoons unsalted butter, melted, 1 1/4 cups semi-sweet chocolate chips, 1.5 cups salted pretzel pieces, 1 cup salted caramel. Directions: Pre-heat oven to 350°F. Spray a 9×9 inc baking dish with cooking spray. In a medium bowl, combine Oreo crumbs and melted butter. Press mixture down evenly into baking dish. Pour about half of chocolate chips over crust. Combine pretzel pieces and salted caramel. Pour mixture over chocolate chip layer. Pour remaining chocolate chips over top of bars. Bake for about 25 minutes or until caramel is bubbling around edges and bars appear set. Cool before slicing. Making a cookie within a cookie may seem pretty crazy to some people. 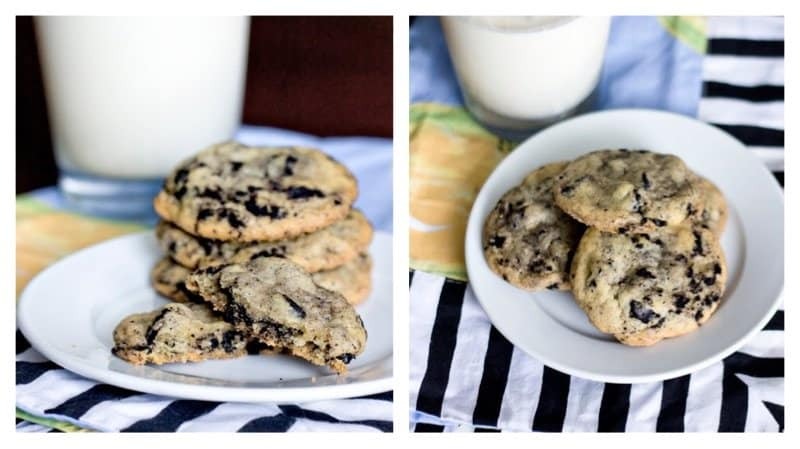 This chocolate chip cookie mixed with Oreos will most likely surpass all of your cookie expectations. Ingredients: 1/2 cup butter, at room temperature, 6 tbsp sugar, 6 tbsp light brown sugar, 1 egg, 1 tsp vanilla, 1 1/4 cup all purpose flour, 1/2 tsp baking soda, 1/2 tsp salt, 12 Oreo’s, crushed into small pieces. Directions: Preheat the over to 350°F. Cream together the butter and sugars until light and fluffy. Add egg and vanilla and beat until well mixed. In a medium bowl, mix together flour, baking soda, and salt. Slowly add the dry ingredients into the wet until just combined. Gently fold in Oreo pieces. Scoop dough onto an ungreased cookie sheet about 1-2″ apart. Bake for 8-10 minutes. Let cool for a few minutes, then transfer to a cooling rack to cool completely. Do you ever crave a Frappuccino but never feel like making the drive to the nearest Starbucks or your local coffee shop? 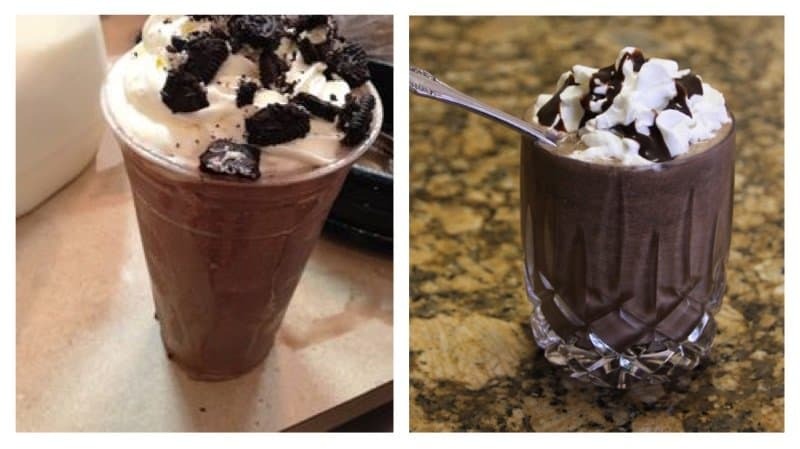 This Oreo Nutella Frappuccino recipe is perfect for you. Ingredients: A large handful of ice, 1-2 shots of freshly brewed espresso, Double Stuffed Oreo cookies, 3 tablespoons Nutella, 1/2 cup milk, whipped cream, your choice of syrup. Directions: Place ice in blender. Add espresso shots, four Oreos, Nutella and milk. Blend together until smooth. Pour Frappuccino into a cup. Top with whipped cream and a syrup of your choice. 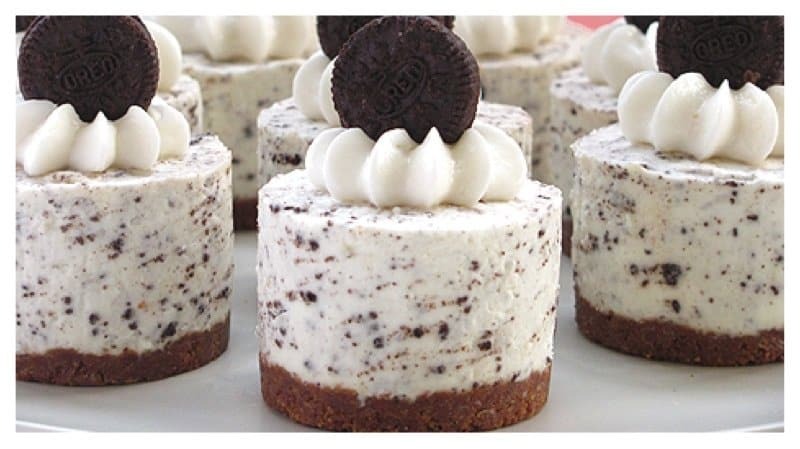 A great way to share an Oreo Cheesecake is to make them into individual cheesecakes. This easy no-bake recipe will disappear in no time. Ingredients: Crust: 1 1/2 cup crushed graham cracker, 1/4 cup packed light brown sugar, 7 tablespoon melted unsalted butter. Cheesecake: 2 1/4 cups heavy cream, 1 pound cream cheese, softened, 2/3 cup sugar, 1/2 teaspoon salt, 1 tablespoon lemon juice, 2 teaspoon vanilla powder, 3/4 cups Oreo Cookies, crushed. Directions: Crust: Combine graham cracker crumbs with sugar. Add melted butter and blend until combined. Press into pan. Cheesecake: Beat heavy cream until medium peaks form. Add cream cheese, sugar, salt, vanilla powder, lemon juice to a bowl and beat until smooth. Add cream cheese mixture to heavy cream and beat until incorporated. Gently fold in Oreo cookies. Fill pan with a slight mound at the center, as the cheesecake will become slightly sunken at the center. Refrigerate for at least 6 hours to set or overnight for best results. Remove from refrigerator and smooth top to level with edges. Serve with whipping cream and top with mini Oreos. 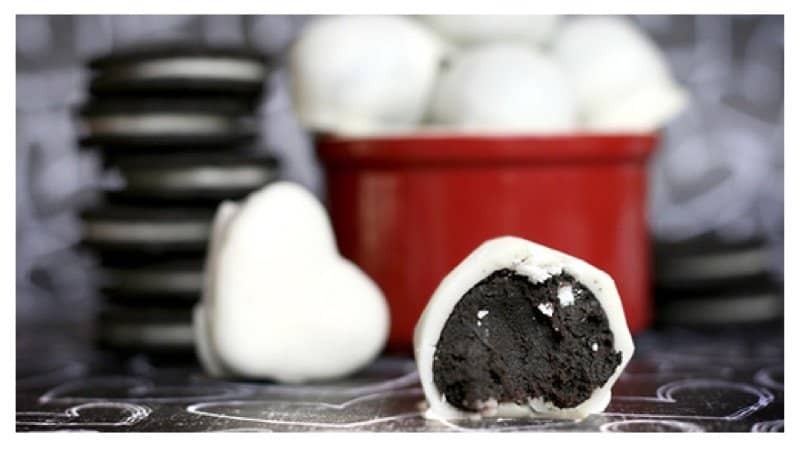 Oreo Ice Cream Truffles is another triple threat treat that will make your mouth water. It’s an easy recipe that can cool you down during the upcoming hot summer days. Ingredients: Any ice cream of your choice, finely ground Oreos, and Popsicle sticks. Directions: Place a large baking sheet in the freezer for 10 minutes. Using an ice cream scoop, add scoops of ice cream to the chilled baking sheet and immediately return to the freezer. Let the scoops chill in the freezer until it’s frozen again for at least 20 minutes. Place ground Oreos in a bowl. Then one at a time, use a spatula to remove a scoop of ice cream from the freezer and transfer to the bowl of ground Oreos. Roll around until entire scoops are coated. 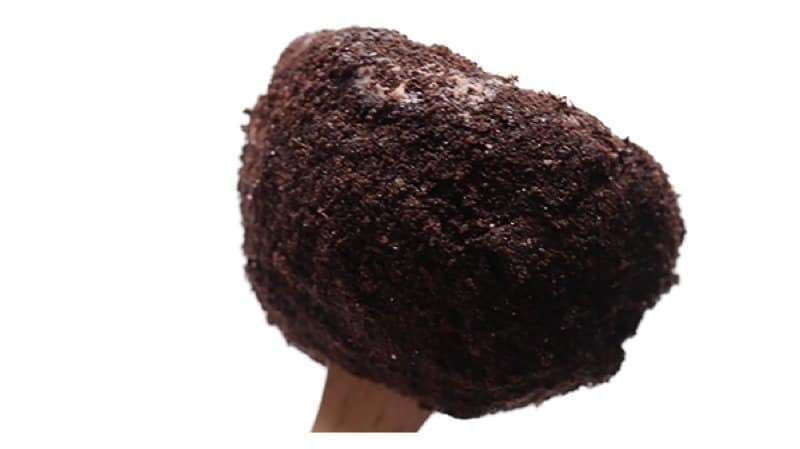 Return to the chilled baking sheet, and place a popsicle stick in the middle of the truffle. Repeat until all scoops are coated. Serve chilled.